The 2015 Dodge Grand Caravan is a perennial favorite for anyone that needs to haul their family and all their stuff around, and this years is better than ever. Sulphur Springs Chrysler Dodge Jeep Ram are specialists in family minivans and family value serving residents of Tyler and Greenville, TX. The 2015 Grand Caravan features a standard 3.6-liter V6 with plenty of power, backed by a six-speed automatic transmission and front-wheel drive. Four-wheel anti-lock disc brakes and stability control are standard too, as are plenty of airbags. Every Grand Caravan features seating for seven in three comfy rows of seats. Trim packages for the Grand Caravan include American Value Package, SE, SXT, and R/T models. The AVP is the basic people mover, but still comes nicely optioned with power mirrors, power locks and front windows, tilt/telescoping steering wheel, and a four-speaker audio system with CD player and auxiliary jack. Add the Uconnect Handsfree Group and get Bluetooth and voice controls, USB input, and satellite radio. Move up to the SE level to get the Stow 'n' Go seating, tinted windows, three-zone AC with rear seat vents, and a six-speaker entertainment system. The SXT trim includes all SE equipment, then adds power sliding doors, power liftgate, and power rear windows. Optional on the SXT is a rear-seat Blu-ray entertainment package with 2nd and 3rd row screens, which also gets you a rearview camera and upgraded touchscreen display up front. 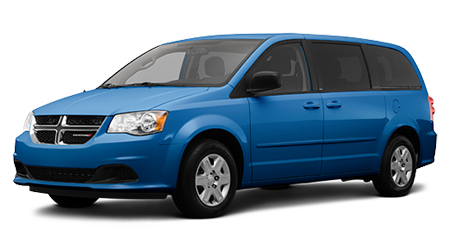 Top-level Grand Caravan R/T models include 17" alloy wheels, sport suspension, special trim, and heated leather seats, plus all the standard equipment from the lower trim levels. The Blacktop appearance package for SE and SXT models is a great option if you want extra style. This package brings unique 17" wheels, special trim inside and out, and premium seats. R/T buyers can also get a special Safety Sphere package, which includes electronic safety aids like blind-spot monitors, cross-traffic detection, and more. Dodge buyers come to Sulphur Springs CDJR from Tyler and Greenville, TX because we know how to treat our customers. Need an affordable, reliable family hauler? Check out the family of 2015 Grand Caravan models available in Sulphur Springs, TX now.